The revised data suggest that GFCF fell sharply following the onset of the economic downturn, as businesses revised priorities in the face of a reduction in domestic and international demand, and as conditions in credit markets tightened. 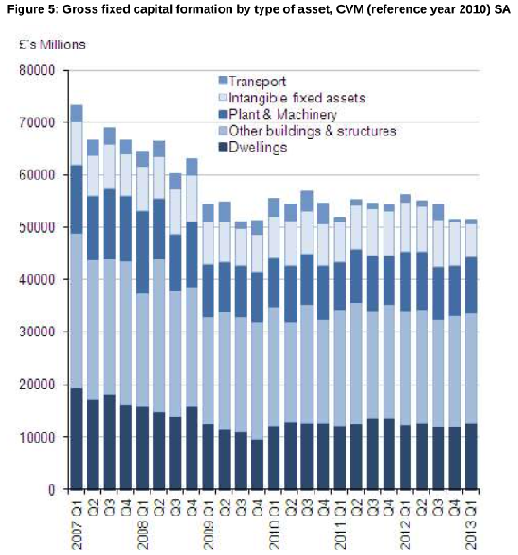 The downturn in the housing market also had a substantial impact on investment in Dwellings, which fell from £15.8bn in Q1 2008 before the economic downturn, to just £10.9bn in Q3 2009. Investment in Plant & Machinery also fell, while investment in Other Buildings & Structures and Intangible Fixed Assets remained relatively static during this period. Basically, businesses just don't seem to be investing much. I'm particularly amused by the drop in "transport": it seems company cars are out of fashion. ONS explain the 2005 spike as being due to the reclassification of British Nuclear Fuels Ltd. But they don't discuss the other evident spike - the one in 2007-8. The bubble-like nature of business investment at that time is painfully evident in this chart. We now know that some of that was the overblown housing market, and much of the rest was the even more overblown financial services industry. The financial services industry is now more than 13% smaller than it was in 2008 before the crash. 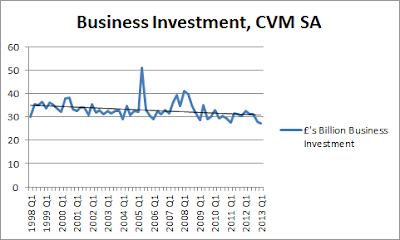 Yes, that's right - a secular downwards trend in business investment for (at least) the last 15 years. ONS says the total fall over that period is about 10%. So the 33% fall since 2008 isn't quite what it seems. The 2008 peak was way above the long-term trend, and all that seems to have happened is that investment has fallen back to trend. In which case moaning about lack of private investment, and keeping interest rates on the floor in the hope that the private sector will spend some more money, just might be a bit futile (though that is not the only reason for keeping interest rates low, I hasten to add!). I can think of several reasons why business investment might be in long-term decline. Falling cost of technology, for example. Availability of abundant cheap labour in developing countries making capital investment in (expensive) advanced technology uneconomic. Relative decline in manufacturing and growth of services. But if anyone has any more ideas, or objects to these, please do say so in the comments. I wouldn't like to assume that falling business investment is necessarily a problem. 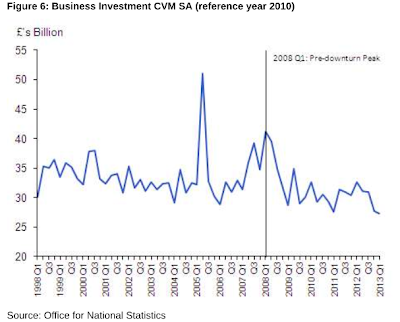 Remember that the ONS's business investment chart records the amount of capital invested, but says nothing at all about the return on that capital. If the cost of capital is falling, then business investment could actually be increasing.The only part of "gross fixed capital formation" whose price we know was rising prior to 2008 then suffered a fall was property. The prices of plant and machinery could well be falling through the floor. And if they are, that might go some way towards explaining why ONS's figures for plant and machinery investment show falls since 2008. When prices are falling, companies defer spending decisions in the hope of further price falls. Deflation in plant and machinery prices, coupled with poor demand and an uncertain economic outlook, might act as a fairly serious deterrent to corporate capital investment. Maybe it's nothing, but.....it would appear that the 10-year gilt yield has also been in decline for the last 15 years. The 10-year gilt yield is used as a benchmark rate for all sorts of lending - and much corporate capital investment is debt-financed. Coincidence, much? Oh, and just in passing, that gilt yield chart is another nail in the coffin of the idea that central banks control interest rates. The 10-year gilt yield was already in long-term decline when the financial crisis struck, and there's no evidence from that chart that either the base rate cut or QE had all that much effect. Fitting an imaginary trend line by eye, I would say that yields were above trend (i.e. too high) in 2007-8 and again (slightly) in 2010-11, then a bit too low in 2012 and are now about where they should be. In which case we perhaps also have about as much business investment as can reasonably be expected. I may have read too much into the gilt chart - I admit its relationship with business investment is somewhat tenuous. 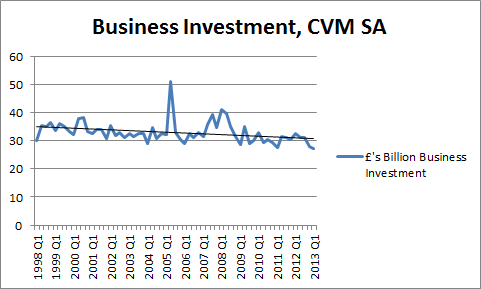 But the trend on the business investment chart is striking. If business investment is actually at a level consistent with its long-term trend and with the path of long-term interest rates, then further incentives to invest are not likely to be effective. This does not bode well for an economy that still has unemployment at nearly 8%, falling real wages and substantial under-employment. I fear that if we want to deal with these, the necessary investment must come from the public sector, not the private sector. Seems the UK's investment decline has been going on for 50 years, not 15. Any suggestions as to why this might be? 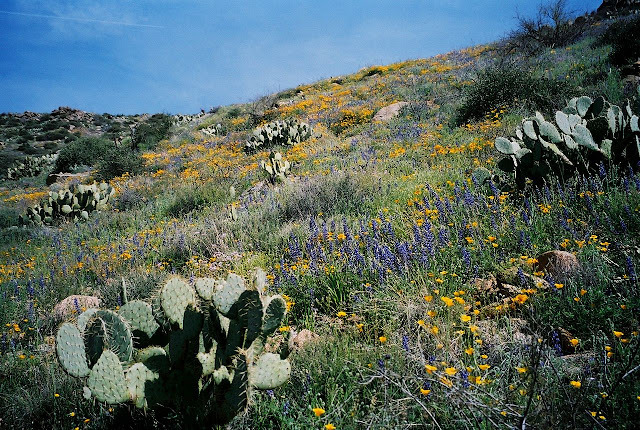 Shire Blogger suggested that maybe too much investment is going into property. Diversion of investment overseas seems possible too, given the UK's status as a large financial centre. Suggestions welcome. 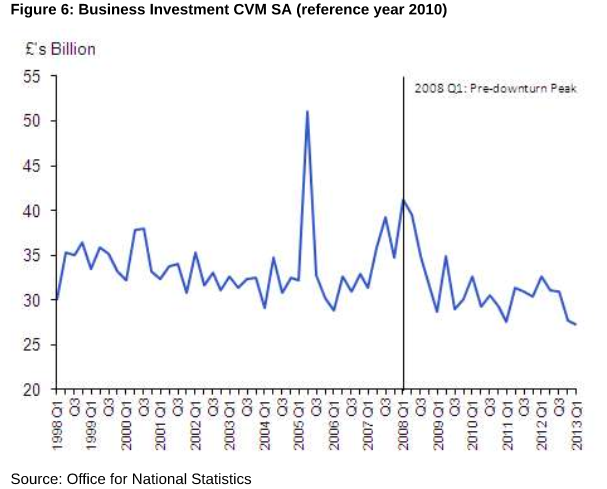 One interesting point of note is that the same data reported last year (UKEA 2012 Q4) was showing a slight upward trend in business investment volume over the same period, although still declining as a % of GDP. The ONS has made a number of changes to their calculation methodology and I assume that the latest figures are better. I think the difference is mainly due to changes in the chain-linking methodology rather than of the other revisions, but I'd be interested if anyone knows better. In any event, it further highlights the difficulty of interpreting aggregate capital data. I suspect the decline in investment has three primary causes, firstly the emphasis on property assets, secondly the geographical outsourcing of manufacturing capacity to areas with cheaper labour and thirdly the demographic shifts which require our economy to move from production to services to satisfy domestic demand. Health, social care and other personal services for an older population will require a rebalancing of the economy. There is now a shortage of housing so it is clear that extra housing construction will generate growth and reduce pressure on house prices and rents (long overdue). I expect that investment will pick up much more strongly than currently forecast over the next 12months and companies who have plenty of cash will start spending it at last. There is a catch-up effect from underspending, replacement demand, increased emphasis on infrastructure and so on. I forecast that the UK economy is going to be stronger than expected in the next couple of years as investment picks up. There will then be a tussle between the central bank and the markets, as interest rates come under upward pressure. That will be interesting to watch. Couple of additional points - relative fall since late 70s in manufacturing as share of GDP and absolute number of manufacturing companies probably a significant factor in long-term secular trend. Most manufacturers I talk to haven't seen a fall in plant & machinery prices. To the contrary, as most of the machines we buy are imported, they have seen prices for plant & machinery rise as the pound has weakened. Additionally, firms in the UK aren't competing on labour costs, but innovation, which means capex intensity within a firm should be rising. However, cash flow issues in the supply chain have left many firms diverting growth capital to cover working capital needs and the cost of capital generally is high in the UK. Factors include falling tax depreciation rates (even as asset lives shorten - there's a stark mismatch here) and lack of affordable medium-term debt finance in the UK. If 10yr yields have been steadily coming down, (a) should the return on capital business looks for also come down (b) if so, are businesses looking for lower returns than they were,say 15 years ago, or are they setting too high a hurdle when deciding whether to invest? We have the opportunity to at least increase business investment from here if we focussed on productive parts of the economy that will also generate a return on that investment. Principally energy (green), agri-tech, bio-tech... Quite right that the public sector must take a leading role in this because as the graphs demonstrate, the private sector does not have a great record in the kind of transformative business investment that we need. This is all covered by the excellent Marianna Mazzucato's recent work on the 'entrepreneurial state'. Perhaps the UK, as a service-centric economy, is investing relatively more in human capital through training and education, and less in physical capital, when compared to, say, Germany ? This is an awesome blog post. The trends are clear to see and need to be explained so that correct policy can be formulated. 1) The computer and tech revolution that has been hotting up and changing things - I mean emails instead of letters - the list is enormous. Tech increases efficiency and reduces costs and does not depreciate so fast. If it needs replacing its relatively cheap. Not always, but as a general trend I mean. 2) The use of property in a speculative, almost Ponzi, way instead of just consumption as it used to be. 3) Out-sourcing of capacity, particularly in manufacturing to lower labour-cost regions on the planet. In my last comment I meant that interest rates (eg 10 year treasury) descend and are not allowed to become negative. I was confusing CPI and treasury rates. I have a completely general candidate for decline in business investment. It's either of great importance or false, so I'd appreciate an expert appraisal. Your data suggest a decline in the UK this century of around 1%/year. I think you'll find this trend identifiable from far earlier, and in other developed economies. Every unmanipulated Okun plot I've seen does *not* pass through the origin; such plots indicate a secular trend of decreasing employment (per unit GDP) of around 1%/year from at least the '70s. On the reasonable assumption that capital and labour trends will be similar in the longer term, that both actually decline by around 1%/year isn't coincidence. It's a commonplace that we persistently "do more with less" - we get better at any technology over time. Any replacement technology must be potentially much better that an existing optimised one. So, improvement persists across technologies, and generalises to the whole real economy. A direct consequence of this is a persistent decrease in both capital and labour resources needed to operate the economy. If this argument stands up, we're going to have increasingly more people and capital than we yet know what to do with. This in no way invalidates the local, temporary, and geopolitical drivers mentioned, but addressing the problem at that level might not serve. Harding gathered various suggestions including short term profit maximization and the rise of monopoly power. I believe it's probably a mixture of reasons, but the increased consolidation and size of many businesses may be a factor irrespective of monopoly power. Could another factor be the type of government expenditure? If government is investing proportionately less in infrastructure over the 15/50 years that would affect business investment? I think property has a huge amount to do with it. 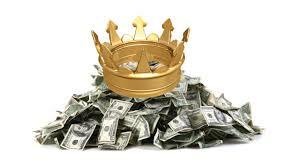 I work with a lot of business owners and at some point they will all, almost without exception, look to take money out of the business and put it into property, because that has been easier than growing the business (they still think it is and will be in the future). The same is true of large businesses. Take Lord Sugar, for example. A real entrepreneur, and big business builder but now the majority of his wealth lies in Amsprop, his property company. If someone with his wealth, knowledge, contacts and experience turns to rent extraction because it's easier than building real wealth, then little wonder that small business owners around the country do the same. The environment for employing capital and labour productively MUST be improved if we are to reverse this trend, though I see little prospect of it happening at the moment, unfortunately. This measure of investment seems very "structures" oriented, when shifting to a service economy some genuine investment in less tangible things will just drop out of this metric... And it's more than just education/training. Also financial engineering may play a (small?) role: if an airline switches from buying planes outright to leasing them from an offshore/overseas entity, they drop from national accounts as investment (I presume) while the situation on the ground is little changed. It because of the collapse of primary & basic secondary production over time. The gadgets from complex secondary production have only worked to increase scarcity over time which is how the banks make money - scarcity. Try to imagine the UK as the Isle of Muck. Before complex inter nation and continental banking the wealth of the Scottish western seaboard was centered on fertile volcanic islands such Muck & Eigg as wealth orbited primary (agricultural) production. However with the scaling up of the banking system and finally with the political union which formalized the big banks power these areas became a hinterland for far away Industrial production of secondary goods. The final land clearances came about after the Napoleonic boom and bust when a form of military fiat was replaced by the bankers deflation....this deflation scaled up the system to the Americas and elsewhere. The deflation of the 19th century enriched a certain select Victorian crew. The islands in the late 19th century were of little intrinsic value as production had moved both in its type and location. However despite this the land values remained inflated because of the inflated wealth claims of the few not unlike UK land asset price inflation today which is a result of a dramatic real goods trade deficit. So Mucks fortunes today depend on tourist revenue from the ferry and discretionary lobster consumption in far away places. 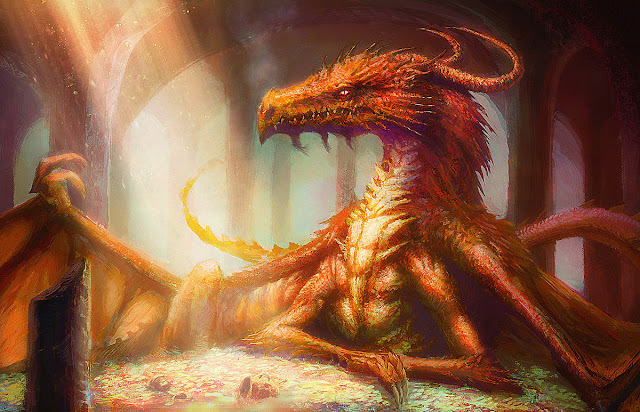 But what if the mainlands economy crashes ? Muck may have fertile land & rich seas but no external market for its goods. The UK does not even have that given its population density which is a result of the banks wishing to sweat out a declining yield from their human assets by increasing the population via a recent second plantation event. Its all a question of Scale and I am afraid the world is all scaled out.